Unstructured data sources like audio recordings, open-ended survey comments, emails, and social media posts offer a treasure trove of qualitative customer experience (CX) insights—and they’re growing exponentially every day. Our team understands the intricacies of mining unstructured data and leveraging analytics and visualizations to uncover the reasons behind customers’ satisfaction levels and gain actionable insights for improving engagement. ORI has partnered with Clarabridge—industry-leading text analytics and customer experience management (CEM) software provider—to deliver full-service customer experience. Having been named a leader in Forrester’s Big Data Text Analytics Wave, Clarabridge is recognized as the prime mover in the text analytics market, supporting hundreds of deployments across Fortune Global 1000 clients. View data through the lens of Clarabridge’s comprehensive solution for omni-source listening, accurate customer and text analytics, and real-time, guided action to truly hear and understand the voice of the customer. 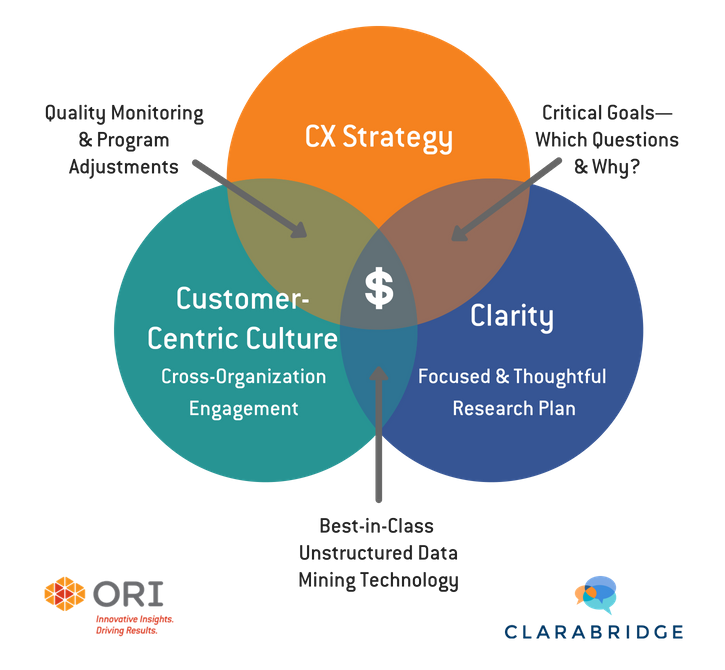 By combining ORI’s proven CX strategy, data collection, and research capabilities with Clarabridge’s leading SaaS customer experience management solutions, gain trusted insights that you can turn into action. Strengthen critical moments of truth with customers by addressing the root causes underpinning negative experiences and feedback. Receive the guidance you need to not only implement customer-focused improvements but to build a customer-centric culture. Together we ensure the best of both worlds: quality service and high-value consulting combined with industry-leading technology.